With proper use and care, your white cast-iron sink's porcelain-enamel finish offers years of high-gloss beauty -- but not under grime or stains. Whether the sink is new or old, its cleaning needs are the same; it's never abrasive-cleaner friendly. Abrasive cleaners scratch and dull the enamel, almost like taking sandpaper to the shiny topcoat. Ideally, you rinse and dry the sink after each use, keeping it shining brightly. In a busy reality, however, gunk and stains build up, stealing the gleam. Reclaim the sink's shine with a nonabrasive cleaner -- even if it's just for the holidays or special occasions. 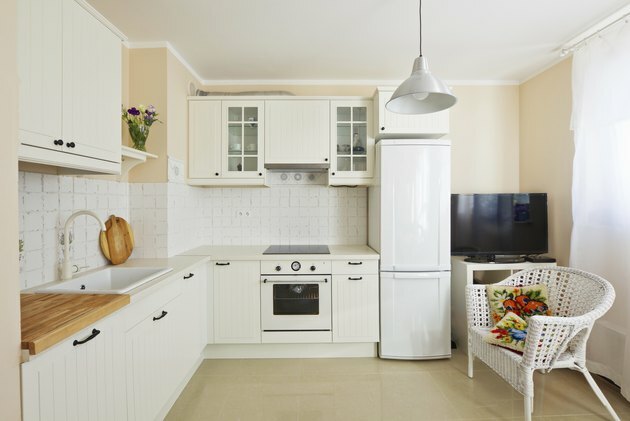 Don't let a dirty white sink disrupt a clean white kitchen scheme. Rinse the sink to wash away any small particles or food bits. Dampen a soft cloth with warm water. Squirt about 1 teaspoon of cream or paste cast-iron cleaner onto the cloth. Wipe the sink with the cloth to remove stuck on dirt or a built-up film. Refer to the cleanser's label for specific directions, which may include leaving it on stained or darkened areas for a few hours or overnight for best results. Rinse the cloth. Rinse the sink to remove the cleaner, using warm water and the cloth. If buildup or dirty areas remain, repeat the cleaning process. For stubborn stains, use a soft cloth and an abrasive cleaner sparingly, suggests Kohler.